MEMOFIN - Guidelines on remuneration policies and practices (MiFID) - L'information financière que vous ne trouvez nulle part ailleurs ! 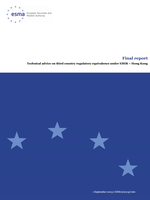 ESMA’s Consultation Paper (CP) ‘Guidelines on remuneration policies and practices (MiFID)’ (Ref: ESMA/2012/570) was published on 17 September 2012. The consultation period closed on 7 December 2012. ESMA received 46 responses, of which 6 were confidential responses. All non-confidential responses have been published on ESMA’s website. ESMA also received the Securities and Markets Stakeholder Group’s (SMSG) ‘Advice to ESMA’ on that CP (dated 16 November 2012, ref: ESMA/2012/SMSG/69). This has also been published on ESMA’s website. This final report sets out the feedback statement to the CP, which provides an analysis of responses to the consultation (including the SMSG advice), describes any material changes to the technical proposals set out in Annex V of the CP (or confirms that there have been no material changes), and explains the reasons for this in the light of feedback received. Section II below sets out the feedback statement, and Annex I contains the full text of the final guidelines.